Below I have a swing analysis of Sergio Garcia. It was great to see Sergio win the 2016 Byron Nelson golf tournament. Sergio has been one of the best ball strikers for a very long time now. But the mental side of Sergio’s game has cost him Majors. I hope that win helps Sergio to make a “major” breakthrough. 🙂 I would like to see that I guess in some part because he’s now the underdog. It’s always good to see someone that the press has written off come good. 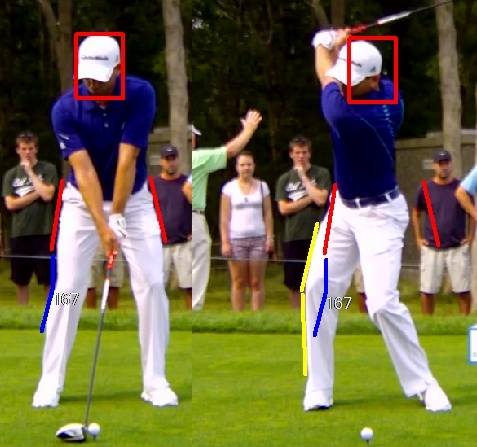 Anyway, in the analysis below it’s done as I was reviewing his swing frame by frame, so the surprise at what he does is genuine. First we’ll start by looking at how Sergio sets up to the golf ball. The most obvious thing in Sergio’s setup is how far back in his stance the ball is positioned. 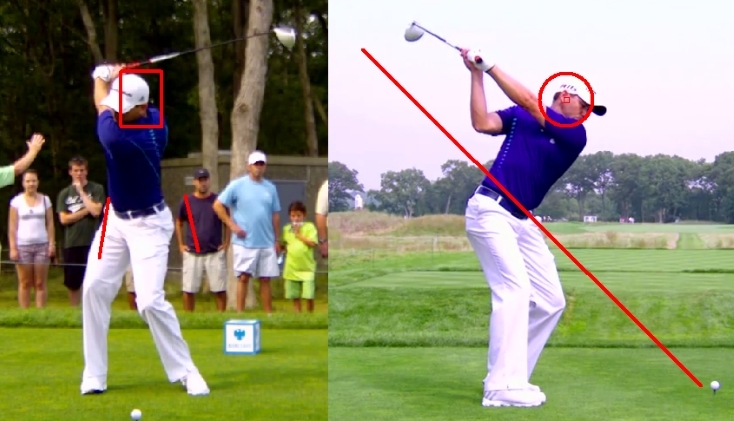 Sergio is well known for hitting down with his driver, and a big part of that is where he is positioning the ball. 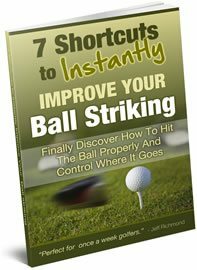 Now hitting down on the ball with the driver will cost you some distance BUT it can be more accurate. 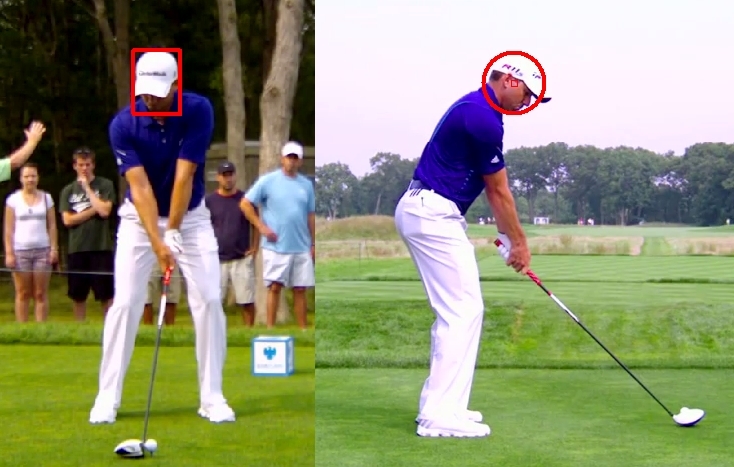 Apart from that, the rest of Sergio’s setup is pretty stock standard. Let’s now look at how he takes the club away. There’s some nice positions there. The club from the down the line view is in a great position. The only thing I notice is his right knee appears to be moving to the right in the face on view. We’ll keep an eye on that. There’s a lot going on from the half-way point in his swing to the top of his swing. He moves his weight to the right side quite a bit during that period. And you can see this by looking at his right foot. It appears his weight is on the outside of his right foot, which is meant to be a big no no. Strangely his right knee has gone to the right quite a bit during the backswing also. Here is a picture of this from the setup position to the top of the backswing. That’s very odd. I’ve ever seen any top pro do that before. 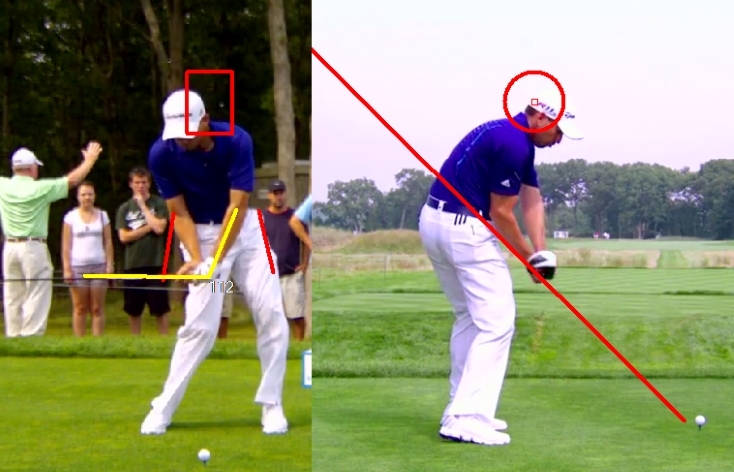 Anyway, notice how laid off the club is at the top of the backswing and how much short of parallel it is. 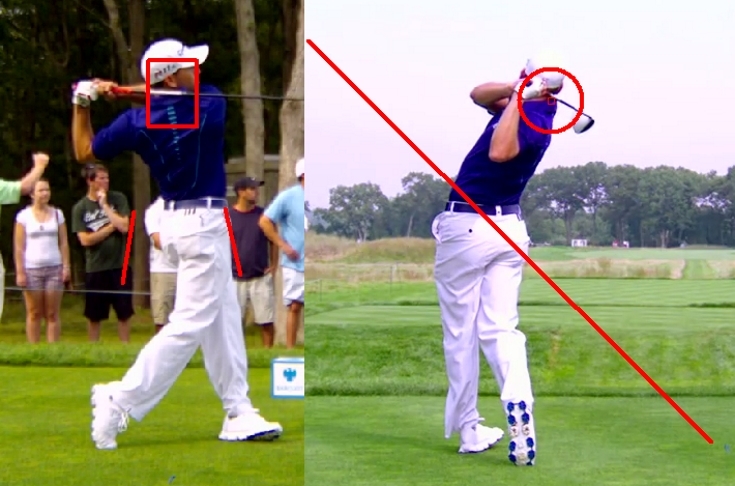 But Sergio does have a big shoulder turn. Ok, let’s see how he transitions the club into the downswing. 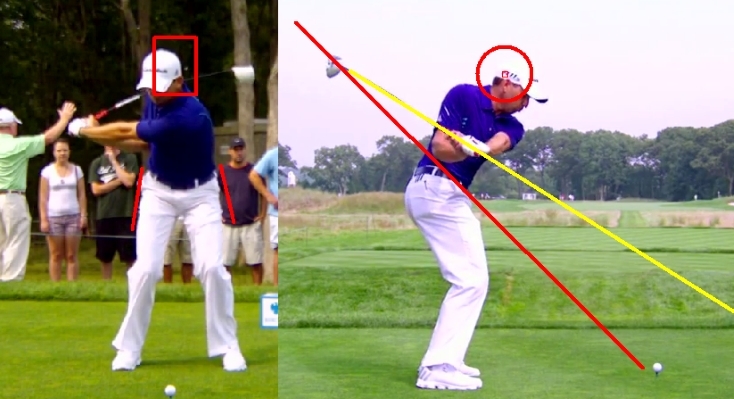 At this point in his downswing Sergio does not have an excessive amount of lag. His head is quite a bit to the right of where it was at setup and down lower, which is fine. My guess is that as he swings through the ball he’s going to keep his head back to try to counteract having the ball placed so far back in his stance. As I thought would happen, the head is going back at impact. 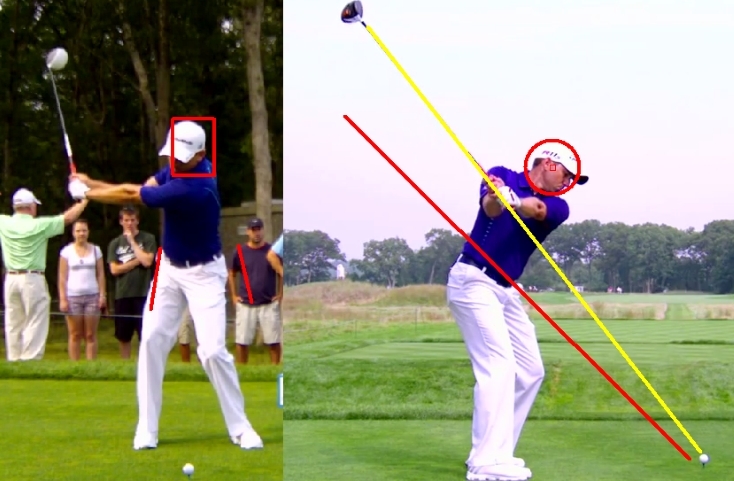 But look at the shaft plane at impact. It’s right on the same plane it was at setup. That’s very impressive! It’s a great impact position and it just shows you that you can do some odd things in your swing (e.g weight on the outside of the right foot, right knee moved to the right etc.) 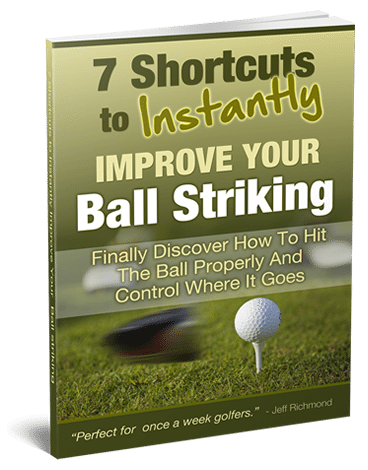 and still hit the ball great IF your swing plane is correct. He has a lot of weight on his right side still and his head is still a long way back. 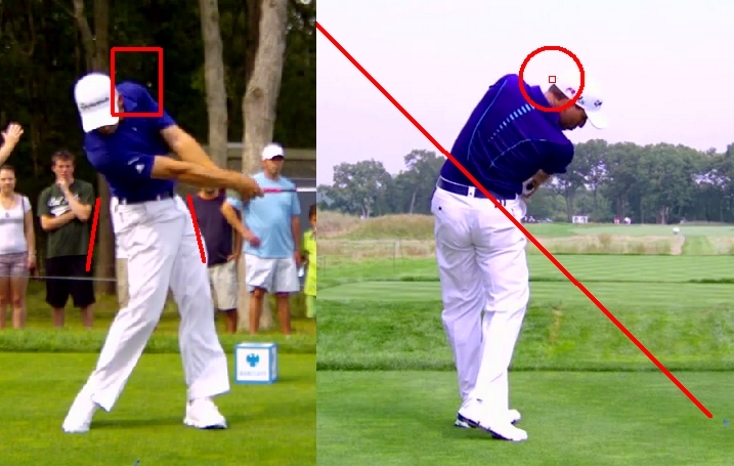 Sergio still has a lot of weight back and his head is still not back to where it was at setup. 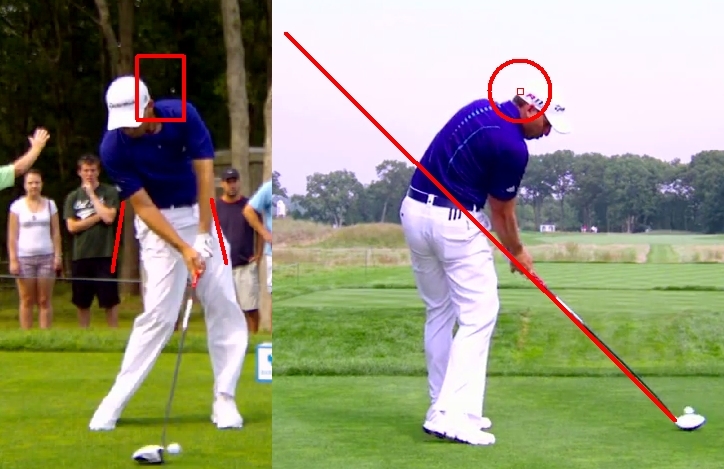 When you look at his finish position you can see that he still has a lot of weight on his right side, but his head is back in the same position it was at setup (although higher). Look at his right foot at the finish. He is crunching his toes rather than being up on the point. That’s probably because there’s still a lot of weight on Sergio’s right side. 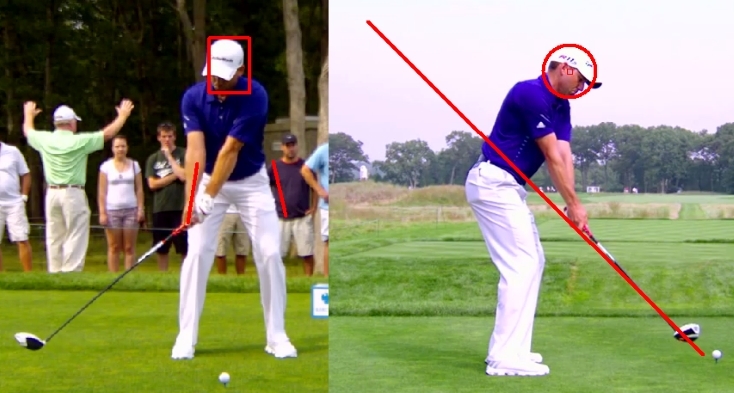 I have never seen any pro golfer have that much weight on their right side from the top of the backswing until the end of the swing. And I have never seen a pro golfer do what he does with his right knee in the backswing. 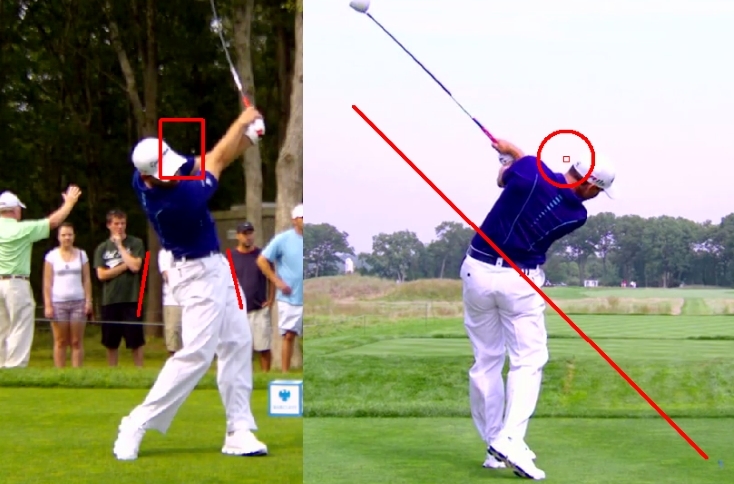 But that just shows you what a great swing plane can make up for. 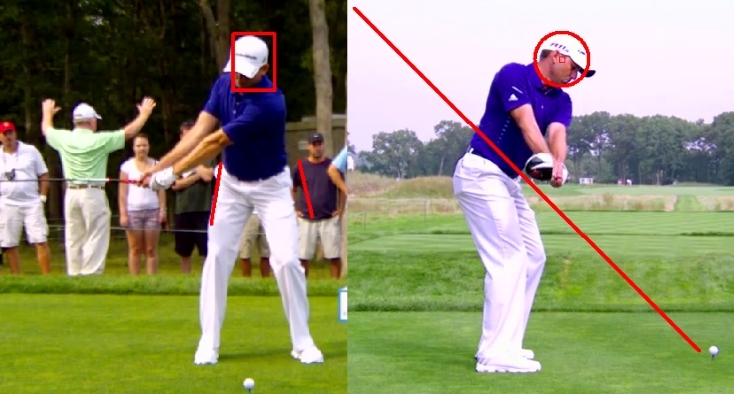 In summary, Sergio Garcia shows that if your swing plane is good then other parts of your golf swing don’t need to be.